Turning the Scenario off produces some interesting results. The option is meant to turn off all cutscenes and any other occurrences which would take control off the player. This means many enemies are removed and as you'll see below, removes some parts of the maps. The first thing I noticed was that almost all the actions that could be performed in the game have been done, including the cutscene where the car is in the water. However, since it didn't actually happen there are some odd results. Firstly, the car while not shown is still there, you run into it if you try to walk near the tracks. Second, looking into the water reveals textured water with no shaders being applied. Also of note is the smoke rising from nowhere and the lack of car's in the river. The bridge is also both collapsed and still intact. Attempting to leave the area is of no use as the truck which was blocking the path still is, although its not being rendered. The only way we can advance is to jump to the next point in the map. Starting from this point we can see that the female Ganado that is impaled is missing, however her blood still flows around where the model would be drawn. Tracing our steps back reveals an odd change in the map, a stream is shown coming down in the area right after the booby traps. The bridge area also shows the same shader-less water. Jumping into the village area doesn't reveal any new things, except the Police man who is no longer being burned at the stake though the fire around it still is present. Next up is the Shoot Mode, which as mentioned earlier unlocks quite a bit of items in your inventory. Below is an image of all of them. There are quite a bit of beta items here, however most when equipped will crash the game. Below is a list of the items and their features. Ill start in the upper left of the menu and work my way to the right, then to the next line. There's nothing really interesting to report on this one. What appears to be the BlackTail. Equipping this crashes the game when you leave the menu. A second handgun, differences are unknown. What appears to be the Red 9 without its stock. What looks like a very old Six Shooter, Part wood. Appears to be a Browning. What looks to be the Striker. What looks to be the Rifle. What looks to be the Semi Auto Rifle. Appears to be the TMP. Equipping this crashes the game when you leave the menu. Checking it produces an off angle 3D view. What looks to be the Chicago Typewriter. Appears to be the Rocket Launcher. Equipping this crashes the game when you leave the menu. Option to reload is there, so this should be a weapon. What looks like the Handcannon. What appears to be the Samurai Edge from the Remake. 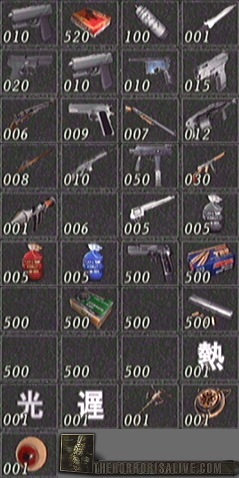 Reload and Examine are this items options, so it appears to be ammunition despite its avatar. What appears to be Rifle Ammunition. What appears to be TMP ammo. Examining reveals an off center 3D view. The symbol translates to "Heat". Equipping this gives Leon heat vision when you press the Z button. More details on this awesome find on the next page. The symbol translates to "Light". Equipping this gives Leon Optical Camouflage when you press the Z button. More details on this awesome find on the next page. The symbol translates to "Slow". Equipping this gives Leon his 3.5 power, which slows down time for everyone except Leon when pressing the Z button. More details on this awesome find on the next page. Appears to be a key of some sort. Appears to be a beta model of Bitore Mendez's false eye. Continue to the next page for coverage of "Heat", "Light" and "Slow"!